He is currently working as an executive producer, special make-up effects supervisor, and primary director on the AMC TV series The Walking Dead and Fear the Walking Dead. Nicotero has directed 25 episodes of The Walking Dead and is the creator of the webseries The Walking Dead: Webisodes. Nicotero claims he began taking an interest in special effects after viewing the film Jaws. He explains: "I kept thinking 'How the hell did they do that?! How'd they build a big giant shark that could eat people?!' So, between that movie, The Exorcist, Planet of the Apes, and of course all of the Universal horror movies [...] I think Jaws and then later Dawn of the Dead were pretty much the two movies that did it for me." Nicotero began his career working in Pittsburgh, Pennsylvania, learning the trade of special make-up effects, also known as prosthetic makeup, from Tom Savini, an award-winning special effects and makeup artist, and helping on films by director George A. Romero. While working on the 1985 Romero film Day of the Dead, he met Howard Berger, who would become one of his partners at KNB EFX Group. Nicotero relocated to Hollywood and moved in with Berger and Robert Kurtzman. 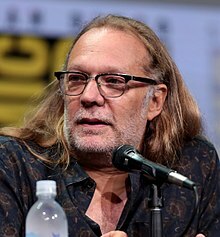 Nicotero worked as special make-up effects supervisor, co-executive producer and occasional director for the TV series The Walking Dead, as well as acting in a few uncredited cameos. He was at the San Diego Comic-Con International for the show. He was a guest on Talking Dead on March 24, 2013, October 12, 2014, February 8, 2015, and February 14, 2016. He also supervises the make-up effects for Fear the Walking Dead. In 2011, Nicotero was interviewed for the 2012 zombie special effects book "Blood Splatter: A Guide to Cinematic Zombie Violence, Gore and Special Effects" by author Craig W. Chenery. He was a guest on the MythBusters Zombie Special on October 17, 2013. 3.11 "I Ain't a Judas"
4.01 "30 Days Without an Accident"
5.09 "What Happened and What's Going On"
6.16 "Last Day on Earth"
7.01 "The Day Will Come When You Won't Be"
7.09 "Rock in the Road"
Wikimedia Commons has media related to Greg Nicotero. ^ "Quentin Tarantino Presents Eli Roth's Hostel" (PDF). Lion's Gate Films. Archived from the original (PDF) on 2007-09-28. Retrieved 2007-08-22. ^ "Oscar Wins". Oscars.org. Archived from the original on 2007-08-09. Retrieved 2007-08-22. ^ Cline, Elizabeth (July 30, 2012). "Dispatches From the Set - Special FX Makeup Artist and Co-Executive Producer Greg Nicotero". AMC. Archived from the original on August 1, 2012. Retrieved August 5, 2012. ^ "Fear The Walking Dead: Special FX Makeup Artist and Co-Executive Producer Greg Nicotero". BD. July 30, 2012. Archived from the original on February 3, 2018. Retrieved August 5, 2012. ^ "THE WALKING DEAD, entitled "Counter" and directed by series MVP Greg Nicotero". Fangoria. July 30, 2012. Archived from the original on April 2, 2015. Retrieved August 5, 2012. ^ "Greg Nicotero Interview". iconsoffright.com. Archived from the original on 2007-09-28. Retrieved 2007-08-30. ^ "Awards". imdb.com. Archived from the original on 2006-05-03. Retrieved 2007-08-22. ^ "John Carpenter: Bios: KNB EFX Group". theofficialjohncarpenter.com. Archived from the original on 2007-09-27. Retrieved 2007-08-30. ^ "More on The Walking Dead: First Production Photo and Zombie School Video". DreadCentral. Archived from the original on 2012-10-15. ^ "Classic Predator Featured in Special KNB Q+A in Louisville". BloodyDisgusting. Archived from the original on 2012-10-06. ^ "Classic Predator to Return in Predators? Hell Yes!". DreadCentral. Archived from the original on 2012-10-13. ^ "Greg Nicotero Talks The Walking Dead". DreadCentral. Archived from the original on 2012-10-15. ^ "SD Comic-Con '10: Get Zombified and Catch a Sneak Peek of The Walking Dead". DreadCentral. Archived from the original on 2010-07-13. ^ "Fear the Walking Dead". BD. Archived from the original on 2015-04-02. ^ "craigwchenery". craigwchenery. Archived from the original on 24 April 2018. Retrieved 24 April 2018. ^ ""MythBusters" Zombie Special (TV Episode 2013)". Archived from the original on 24 April 2018. Retrieved 24 April 2018 – via www.imdb.com.